Karen Gardner is a professional writer and editor based in Maryland. She has a Bachelor's degree in Journalism from the University of Maryland. She is an experienced Health Writer and Editor. She has also chronicled her personal experiences in endurance sports, including marathon running and long-distance cycling. Lipids are fats, and fat gets a bad rap. Many people avoid high fat foods because they think fats will make them fat. But your body needs fat, and lipids can be a good source of that necessary nutrient. Educate yourself about which examples of fatty foods that contain lipids will be good for you to eat, within reason, to create a healthy meal plan. It helps to know what lipids are. They are fats, and fats are needed for the health of your organs. Fats also store energy, so they become a reserve fuel source. Fats help your body absorb and use vitamins A, D, E and K. You should consume fats each and every day. You also need carbohydrates and proteins. Diets that emphasize any one of those nutrients over the others should be considered with a grain of salt. When you see that a food contains fat, it doesn’t always mean you should seek a low-fat version. Healthy fats are important for your body, despite their bad reputation. The Mediterranean diet, for example, can be a good source of healthy lipids. You don’t become overweight from consuming a healthy amount of fat – the key is moderation. You need fats from omega-3 and omega-6 sources, and the ratio should be fairly close. 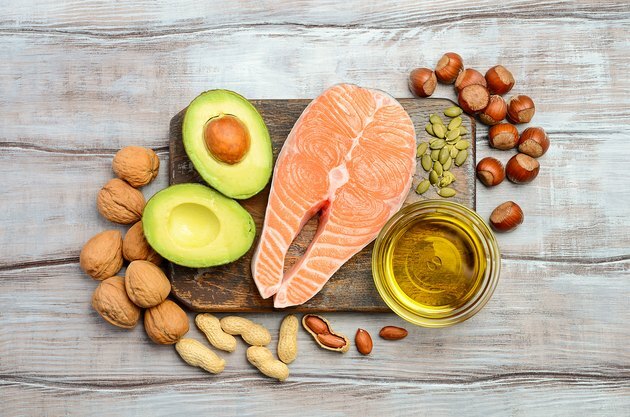 <ahref="https: www.ncbi.nlm.nih.gov="" pmc="" articles="" pmc4808858="" "=""> </ahref="https:>These essential fatty acids are both needed for growth and repair. So foods with lipids are not foods to avoid. But foods with lots of saturated fat, often called bad fats, should be eaten sparingly. Avocados have a high ratio of unsaturated fat to saturated fat. They also have a lot of fiber, which helps to bring down your cholesterol. Avocados are very nutritious, loaded with vitamin K, folate, vitamin C, potassium, vitamin B-5 and vitamin B-6. They have a lot of fat, but it's the healthy fat that will help you feel full. Most fish have lots of lipids. Fatty fish have the highest ratio of omega-3 fatty acids, so the higher level of fat actually works to bring down your cholesterol, as long as you consume reasonable portions. Salmon is good, and wild-caught salmon is better. Canned salmon is usually wild caught, so that’s a good option. Mackerel, herring, anchovies and sardines are other healthy fatty fish choices. Oils are a valuable source of lipids. Olive oil is especially good, because it’s high in unsaturated fats. Flaxseed oil is another healthy source. Canola and soybean oils have fewer omega-3s, but can also be a good source. Vegetables stir-fried in oil let you consume healthy lipids and fiber at the same time. Many nuts are good sources of lipids. Almonds, pecans, pistachios, macadamia nuts, walnuts and peanuts are high in unsaturated fats. Walnuts are also a good source of omega-3s. While you don’t want to consume too many salty nuts cooked in oil, roasted nuts – especially unsalted or lightly salted – are a healthy snack. Limit them to a handful, and you’ll be giving your body some good fats without excess calories. Nuts can also be added to stir-fries and stews. Eggs contain lots of cholesterol, and for years, people were advised to limit their consumption of eggs for this reason. But it turns out that the cholesterol found in eggs doesn’t affect the cholesterol in the blood for most people. If you can tolerate dairy, full-fat yogurt is a source of several nutrients. It is high in saturated fat, like cheese and other dairy products, but eaten as part of a healthy, Mediterranean-style diet, yogurt provides lots of probiotics that can help with digestion and possibly heart disease and obesity. However, you’re negating the good effects of yogurt if you consume yogurt loaded with sugar and artificial ingredients. Stick to plain yogurt, and add your own fruit and natural sweeteners like honey. Stay away from foods loaded with saturated and trans fats, or bad fats. These are the foods that tend to be heavy and greasy, and often cause uncomfortable digestive issues. French fries, foods made with an overabundance of butter, a burger piled high with bacon and cheese, doughnuts, cakes, pies and other baked goods – to name a few – have lots of calories, salt and sugar, along with fat. Universal Class: Nutrition Facts: What are Lipids? BBC Bitesize: What are Lipids, Oils and Fats?